Let me express to you my sincerest gratitude for your participation in the Days of the Northwest region of Russia in the Chinese National Republic, held from October 17th till October 21th, 2006 in Beijing. The performance by your ensemble made it possible to create a favorable atmosphere of unification of the Russian and Chinese visitors to the event, who noted high level of your interpretative skill. Such an atmosphere was created by the bright, inimitable, creative collective who demonstrated a life-long devotion to the art of music. I believe that, owing to your talent, inexhaustible energy and purposefulness, you will please your admirers for many long years with your wonderful playing, keeping up the best traditions of the Russian school of music. Leonid Valentinovich, do accept my sincerest wishes of happiness, health, well-being and creative success. On 9th and 10th of January, 2008 the Consulate General enjoyed highly successful concerts of the St.Petersburg Virtuoso Ensemble “Maestro” headed by the composer L.V.Levashkevich. The skill of the performers aroused well-deserved admiration by the representatives of the city authorities, present at the concert, led by the Lord Mayor of Gothenburg J.Linder and the chairman of the local municipal board I.Johansson, as well as by the business, cultural and scientific elite of the region, and the local consular corps. Our compatriots living in Southwest Sweden, who were invited to the event, had an opportunity to plunge once again into the world of the Russian folk song performed by the soloists of the ensemble – laureates of international competitions. Holding similar events in the Consulate General, as practice shows, positively affects the forward development of bilateral Russian-Swedish relations, creates a kindly soil for an interested, mutually beneficial dialogue on all spectrum of interaction between the two countries, and also helps strengthen contacts between compatriots living in the region. Taking into account the absolute success of the Petersburg musicians who have presented their programme in Gothenburg, we hope for continuation of fruitful cooperation between the Administration of St.Petersburg and Consulate General in this direction. We were a group of Swedes, both from the City Council of Gothenburg, from the consular corps of western Sweden and people from the business sector in the city, who had the great pleasure to be invited to a concert at the Russian Consulate General in Gothenburg on the 10th of January 2008. Let me on behalf of the guests express our sincere gratitude and convey our thanks to the musicians of the “Maestro” Ensemble for the concert. It was certainly a great pleasure to be present at this concert of musicians from Saint Petersburg, that gave us a new sudden view of the Russian present-day cultural environment. A great mastery demonstrated by the musicians skilfully combined with the subtle technique was estimated by the listeners at its true worth. Events like this concert have a great and significant influence on the development of mutual confidence between two countries and contribute to our better understanding. Being without the politics and beyond conventionalities culture has ever bridged the gaps and made peoples closer. The concert at the Consulate was just another vivid evidence of that. The concert became a fine event in the cultural life in Gothenburg, and we hope for further meetings like this also in the future. On January 11th this year in the Embassy of Russia in Norway there took place a concert of the St.Petersburg Art Union “Maestro”, led by L.V.Levashkevich. Their masterly performance of classical and author's works deeply impressed the audience. Performances at such a high professional level represent the riches of Russian culture in the most impressive way, contributing greatly into the development of cultural cooperation between St.Petersburg and Oslo. Considering close connections between the two cities, in particular, the Cooperation agreement between the Government of St.Petersburg and City council of Oslo, signed in Oslo in November this year, we would consider it very desirable to involve the ensemble in performances in Oslo in the future. Let us forward to you copies of letters, addressed to the Governor of St.Petersburg V.I.Matvienko, which arrived from the Consulate General of the Russian Federation in Gothenburg (Sweden) and the Embassy of the Russian Federation in Norway, expressing gratitude for highly successful concerts of your ensemble on January 9th, 10th and 11th this year. We find great pleasure in hearing such flattering reviews of recent concerts which have continued a tradition of winter musical meetings in the Russian diplomatic mission in Gothenburg. It is also pleasant to know that the concert, held in the Russian Embassy in Norway, was a success with the Norwegian public. Dear Leonid Valentinovich, let us also express to you our gratitude for your ensemble participating in such significant international events, which certainly have promoted further development of cultural cooperation between our countries. We hope that this tradition will last for many long years, and the further cultural cooperation between Russia, Sweden and Norway will henceforward be as effective and fruitful. My dear friend Ilja Iosifovich! On January 8th, in the Embassy, the New Year's masquerade dated for the Orthodox Christmas took place, which has almost become a tradition. More than 500 Swedish and other foreign visitors – ministers, politicians, representatives of the business community, heads of industrial corporations, deputies of parliament and members of the Royal Court, diplomats, representatives of cultural elite and Russian diaspora became participants of the cheerful event. Following the best Russian and Swedish Christmas traditions an overwhelming majority of visitors, including Minister for Foreign Affairs Carl Bildt with the family, Minister of Agriculture Eskil Erlandsson, the special representative of the Secretary General of the United Nations Jan Eliasson, the marshal of the corps diplomatique, former Swedish ambassador in Moscow Sven Hirdman were wearing fancy-dresses. The easygoing atmosphere of the festivities was added to by hot pies and Siberian meat dumplings, appreciated by the Swedish visitors. A real gem of the festival was the appearance of the consummate musicians from the St.Petersburg based team “Maestro” headed by Leonid Levashkevich, performing popular classics and Russian traditional songs throughout the evening. The performers managed to create a special atmosphere of ease and warmth which promoted formation of a positive image of our country, as well as popularization of the Russian Northwest region. Great mastery of the musicians from Petersburg, their cheerful nature will for a long time be remembered by the employees of the Embassy, who took incomparable pleasure in meeting the team. I hope for continuation of the close and fruitful cooperation between the Administration of the Northwest federal district and the Embassy for the benefit of the Russian Federation. Always looking forward to your visit. Shaking your hand. Thank You very much for a fantastic evening. It was one of the absolute best concerts we have been to FABULOUS. You are also an incredible musician. Everything was arranged very nice, charming way. Eksjö municipality wants to thanks General Consulate of the Russian Federation in Gothenburg and “Maestro” ensemble of Virtuosos from St.Petersburg for one unprecedented concert in our church in Eksjö 2008-06-16. The performance became a music experience and something to remember for long time. Our expectation is to have a possibility to meet you again and we really appreciated that you made the decision to visit our small town. We think this can be the first step in coming co-operation, not only in business, but even in the field of culture and music. It will bring our countries and people closer together. Dear Mr. Mnatsakanyan, dear David! We are writing to you to express our most sincere thanks for your cooperation in arranging the concert on June 18th, 2008, with Saint Petersburg Virtuoso Ensemble “Maestro” on your premises. The invitation to our most valued customers in Gothenburg was received with great interest and the number of participants – well over 100 persons – shows that this was a very popular arrangement. We were all very impressed by the outstanding performances of the Ensemble and the various members thereof. The evening was a complete success and we have received many calls and letters from our guests expressing their gratitude for this initiative and the opportunity to listen to world class artists in this way. We would definitely like to meet the Ensemble here in Gothenburg again and shall be pleased to recommend them for similar concerts in cooperation with Danske Bank e.g. in Stockholm. We kindly ask you to pass on our greetings to Mr. Leonid Levashkevich and all the members of the Ensemble thanking them for an unforgettable evening and extraordinary performances. To accompany his performance at the Vancouver 2010 Olympics, Sweden’s best figure skater, Adrian Schultheiss, has chosen the musical composition “My Way” by Russia’s General Consul in Götebor, David Mnatsakanyan. For those long acquainted with David Mnatsakanyan the choice of the Swedish figure skater comes as no surprise. The general consul’s friends know that he is successfully managing two careers – that of a diplomat and of a composer. David Mnatsakanyan’s gift did not appear out of the blue: before entering Moscow State Institute of International Relations he had graduated from a specialized music school under the Erevan Conservatory with major in violin and had worked in the Gosteleradio Symphony Orchestra of Armenia. But diplomacy “overpowered” music, although at the institute Mnatsakanyan often performed in amateur concerts and was known to his friends as “Maestro”. Fortunately, the triumph of diplomacy was not final and irrevocable; otherwise we might never have known the works of the composer David Mnatsakanyan, including “Christmas Fantasia” and “My Way”, dedicated to his wife and daughter. Mnatsakanyan first performed “My Way” at the Royal Club of Götebor. It was also in Götebor, at a concert in the Russian General Consulate, that Mnatsakanyan first met the head of the Maestro Ensemble, Leonid Levashkevich. This was in January 2008. Maestro performed “My Way” in an arrangement by Vladimir Gaponov. Soon after that the trainer of Sweden’s top figure skater, Adrian Schultheiss, heard about the composition – and “My Way” played under the vaults of Götebor’s Scandinavium sports arena during the world figure skating championship in 2008. Few contemporary composers can say that their music has been performed for an audience of 400 million – but that is how many television viewers in Europe and North America watched the championship. In October and November 2009 Schultheiss presented his skating program at the ISU Grand Prix in Moscow and Lake Placid. Next up are the Winter Olympics in Vancouver. 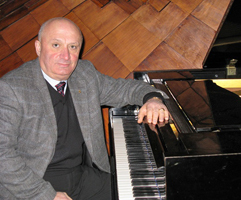 Mnatsakanyan’s compositions have been heard, of course, in Russia too: “My Way” was first performed by the Maestro Ensemble in March 2008 in the White Hall of the Peterhof Palace outside St.Petersburg. Shortly after that Mnatsakanyan was made a member of the ensemble. “My Way” has since entered the repertoire of a number of musical groups. In April 2008 in the Grand Hall of Stockholm’s Musical Academy “My Way” was performed by the chamber orchestra of the Kaliningrad Philharmonic. And on 10 October 2009 it was performed by the St.Petersburg Festival Orchestra at a Hit Parade Opera Music charity concert, part of an annual international drive to support hospices and palliative aid.